I’ve had a lot of fun working on this comic, but due to some mistakes along the way, it’s turned into something not really that aligned with my original intentions, and it’s become a lot less fun. I’m going to let it simmer in my brain a while before taking another crack at it. Besides that, the audience hasn’t really grown since I started it a year ago, and I only have so much time in the day. I have to turn my attention to other projects. For info on those projects, subscribe to my newsletter or twitter. Hello! Welcome! Please enjoy my new comic! So this is DREAM TEAM: TOO DUMB FOR DEATH. 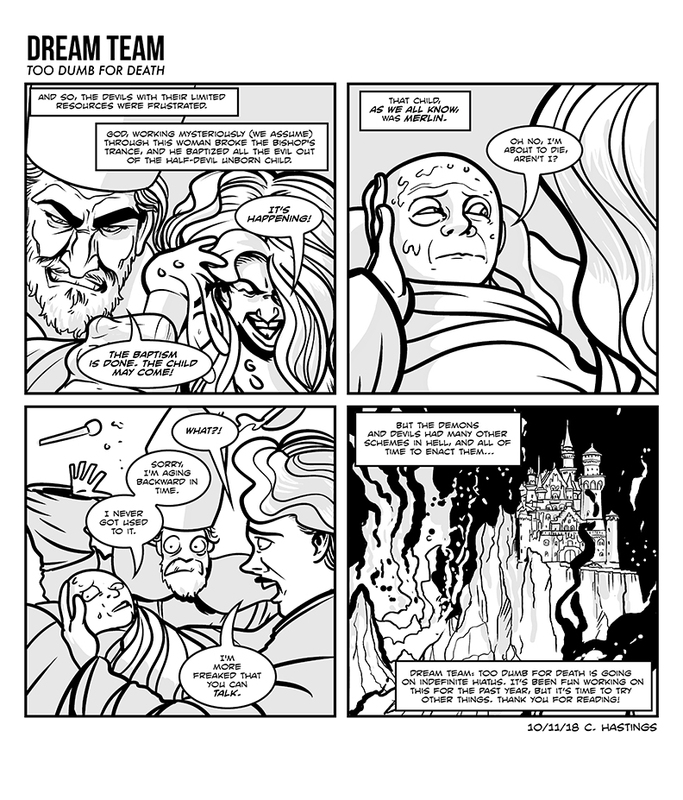 It’s a bit of an experiment in serialized web comics. As you go back to read it, you’ll see it starts as five different weekly strips, and then converges into one story, with still plenty of mystery left in how they are all connected. 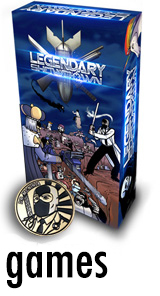 There is still plenty of ground to cover in this comic, but it is very much a shorter series than Dr. McNinja. It will be a while (if ever) before I commit to a 10 year plus long project again. That said, I hope you enjoy it, and I hope to continue the “Hastings Funnies” brand of webcomics as a place where I can just write and draw and upload something in a short amount of time. This project could not have gotten this far without the support of my Patreon subscribers. Comics end up there first, it is the only place where you can read author commentary (the alt text), and I occasionally put up other goodies, like a first look online at my other life as a sketch comedy writer and performer. Please consider subscribing! A dollar a month is plenty. Thank you and enjoy! You can also subscribe to the comic on Twitter or Tumblr. DREAM TEAM: TOO DUMB for death is by Christopher Hastings.